For this page, we will compare several different solar generators in 3 different categories. Click on the category to jump to that section. Small Portable Solar Generators: These are small and compact systems that provide minimal power for smaller loads like a laptop, a few lights, TV or computer and charge your cell phones, These are usually the best solar generator for camping, or for minimal emergency backup, where you still need to keep it very light and portable. Mid-Size : These systems can power lights, a TV or computer, a fridge, a microwave, and most kitchen appliances. These are the best solar generators for emergency backup, camping, running a small cabin tiny home or RV. Large Heavy Duty: These systems are the best whole house solar generators, providing ample emergency backup power. Depending on the amount of solar and batteries with the system, these units can power a fridge, freezer, microwave, lights, TV, computer, well pump, and more long term. 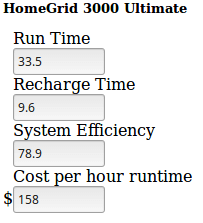 Run times (how long it will run different appliances without sun). 4A modular system can be expanded indefinetly by adding more modules. 6 Goal Zero has an expantion Port to add expantion modules, but we can't find them or any information on them. Maybe it is a feature for the future. 7 Innergy allows you to add led based batteries to there generator, but I would not recomend doing this as it defeats the purpose of having a lithium battery. You would be better off just getting an AGM solar generator in the first place. 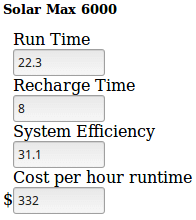 Run Time = The amount of time (in hours) the system will run without any sun. For critical loads such are frigerators, freezers, furnace, etc. This time should be at least 48 hours to last through stormy weather. Recharge Time = The time in hours to recharge your batteries if fully drained to there maximum level of discharge. 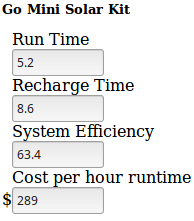 System Efficiency = The average of several efficiency measurements. Anything over 70 is extremely good. Anything under 50 is poor, and you should consider a different system for your application. 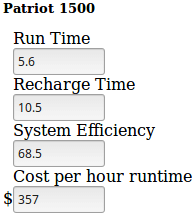 Cost per hour runtime = The amount in dollars it will cost you for each hour of Run Time you have. 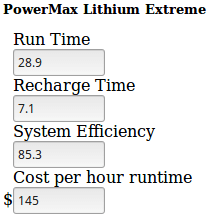 After looking at the results, by far the best small portable solar generator is the Powermax. It outperforms all the rest in every category. 4Idle power is wasted power when the generator is running. You want this to be as small as possible. 5 If the generator is not pure sine wave, appliances may not run, and if they do run they will not run nearly as well as if it were pure sine wave. Modified sine wave inverters do have a lower idle power consumption, but it but your appliances will use about 30% more power with it. 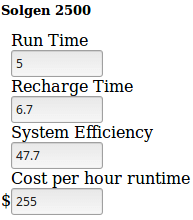 6 By adding a modular charge controller this can go down to 1 Hour. 7 This inverter has a large 5000 watt modified sine wave inverter, and a small 300 watt pure sine wave inverter. 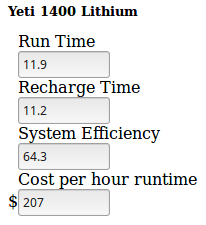 So it can run small appliances with pure sine wave, but nothing over 300 watts. 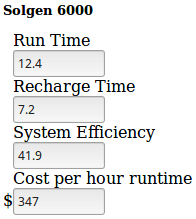 Run Time = The amount of time (in hours) the system will run without any sun. For critical loads such a refrigerators, freezers, furnace, etc. This time should be at least 48 hours to last through stormy weather. 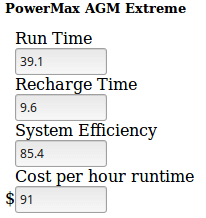 The PowerMax AGM is the clear winner in this area. 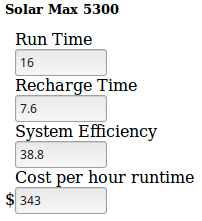 But something also to notice is how poorly the Solar Max 5300 did. This is a result of using very low quality components (PWM charge controller, Modified sine wave inverter, etc), and still charging a premium price. 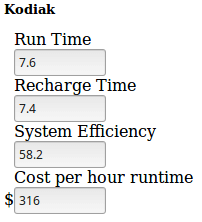 This leads you to having a unit that costs nearly 4 times as much per hour of run time than best system here. 3 Times are calculated using our calculator rather than based off of a theoretical 100% efficiency like many manufacturers try to claim. 4 Idle power is wasted power when the generator is running. You want this to be as small as possible. 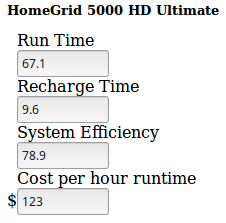 The clear winner of the Large Heavy duty solar generator clearly goes to the HomeGrid 5000HD.